Boston University junior Jordan Greenway recently played in the 2018 Winter Olympics in Pyeongchang, South Korea, for the United States National Hockey team. He is the most recent BU player in a long list of alumni to be chosen to play in the Olympics. "It's an incredible opportunity, a great honor for him, and a great honor for BU," said BU Men’s Hockey Head Coach David Quinn. Team USA did not do as well as they hoped, finishing seventh in men's hockey after being eliminated in quarterfinals by the Czech Republic. Greenway scored a single goal during the games. Jordan Greenway at the semifinal round of the this year's Beanpot Tournament on February 5 at TD Garden. Photo by Gabrielle Turi. Greenway managed everything leading up to the Olympics, from media requests from CNN, to working with Lebron James' company to create a special for Uninterrupted, a multimedia venture about athletes, said Quinn. The 6'5" forward also had the added responsibility of being the first ever African American hockey player to play for the United States Olympic Team. "You probably wouldn't want anyone other than him to have that responsibility," Quinn said. "He's such a smart player, but he's also a good looking kid, so engaging, and charismatic that is you're flipping through the channels and he's up on CNN, you may stop and say, 'Oh, what's this kid got to say?'" Even with everything going on, Greenway is still a junior at Boston University, and maintained his coursework while away at the Olympics. "He's spoken with his professors, so they understand the situation, but he's taking four courses this semester, so a full load," Quinn said. "Depending on how it goes, though, if he needs to, he'll drop one and juggle the other three." Former coach Robert Motzko pridefully talked about Greenway's game style and personality. "The big fella walks into a room and just has a presence," said Motzko. "He just takes shifts over, a quality that big guys can have, has a great demeanor presence, and just holds an aura of, 'I'm here to play.'" "Whether on or off the ice he has this confidence about him that's contagious," said Motzko. "Sure, he's an intimidating player, but he's also just a smart, talented and fun guy to be around. He's one of those players that you want on your team, and in your locker room." 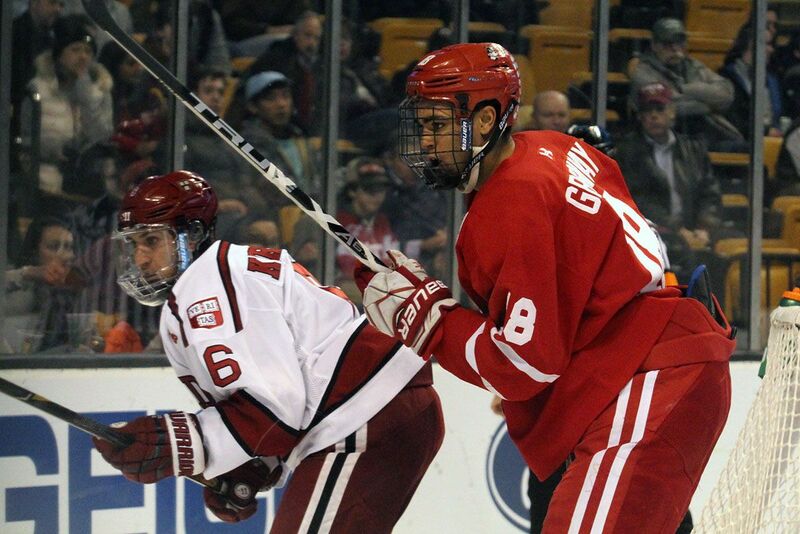 The Beanpot semifinals match up against Harvard was Greenway's last game with BU before heading to the Olympics. Photo by Gabrielle Turi. After spending two seasons with the United States National Team Development Program, Greenway helped the U.S. National Under-18 team claim a gold medal in the 2015 World Junior Championships, then did the same for the Under-20 National team in 2017, while playing under Motzko. Mike Eruzione, BU alum and captain of the famous "Miracle On Ice" team that beat the Soviet Union in the 1980 Winter Olympics, sees Greenway in a similar light. "It's exciting to talk about Jordan when he plays because he's so powerful and can be so dominant," Eruzione said. This season alone, he's already scored 12 goals and contributed 18 assists. "To lose him is not fun," said Quinn. "I know he's excited, but I also know he's sad to be leaving his team at a pivotal time," said Quinn, alluding to the Beanpot Tournament. Because Greenway had to be in South Korea, he wasn't available to play in the title game of the 66th Annual Beanpot against Northeastern this year. Northeastern won, 5-2. His coaches aren't the only ones who speak highly of what he could bring to the table in South Korea. 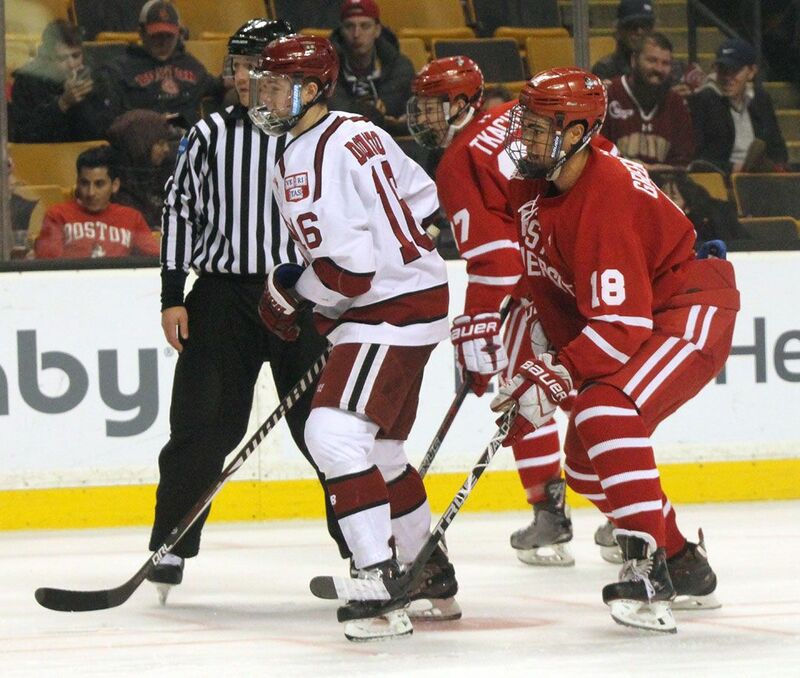 Greenway's linemate, BU freshman Brady Tkachuk, admires his teammate's gameplay. "I've never seen a guy who wins them like Jordan," Tkachuk said. "He has an 'in-your-face' kind of game, and then this capability of dominating down low that makes it so hard to get the puck away from him." Greenway gets up close to Harvard's Colton Kerfoot at the 2018 Beanpot semifinals game. Photo by Gabrielle Turi. Tkachuk mentioned how Greenway also helped him adjust to living in Boston and to playing at the collegiate level, as the two spend a lot of time together off and on the ice. "He's really helped me get adjusted to everything this year, and I definitely don't take our relationship for granted," he said. "Overall though, Greenie's a funny guy, he's a little goofy sometimes, but he's always looking out for everybody, and he's just an awesome guy to be around." BU forward Logan Cockerill, a freshman, said Greenway intimidated him at first. "But then I was really impressed with how humble and down to earth he was," Cockerill said. It's a dream for every hockey player to represent their country in the Olympics, and that dream came true sooner for Greenway due to National Hockey League (NHL) rule changes. The NHL decided they would not allow athletes with NHL contracts to play in the Olympics. "I think it'll be a lot for him to handle, given that he's only 20 years old, compared to my experience when I was 25," Eruzione said. "But I don't look at him as a 20-year-old kid, I look at him as a 20-year-old man, so I think he'll be just fine." *Originally written on February 13, 2018 for class.